I’m not quite sure what got me cooking again today. Was it the retirement specialist I was dealing with who said that he used to photograph food for hotels (he’d followed the blog link in my email signature; I didn’t have the nerve to ask him how I was doing), or was it the calm that has descended on the house since our brief vacation last week, that was sorely needed to restore some kind of sanity to our household. I don’t know, but my mind was able to start wandering again, and as I mused about my beloved almond bread, it occurred to me that the batter wasn’t too far off that for a gougere ….. and then I was off peering at a recipe attempt I made a year or two ago (which produced a delicious, but crunchy, affair) …. and then out popped this recipe. It worked first time! ….. and they weren’t crunchy, and the crust wasn’t too thick, and they weren’t like omelet, and they didn’t sink after they came out of the oven. Lucky, or what! I’m not proud; I’ll admit to accidental successes. 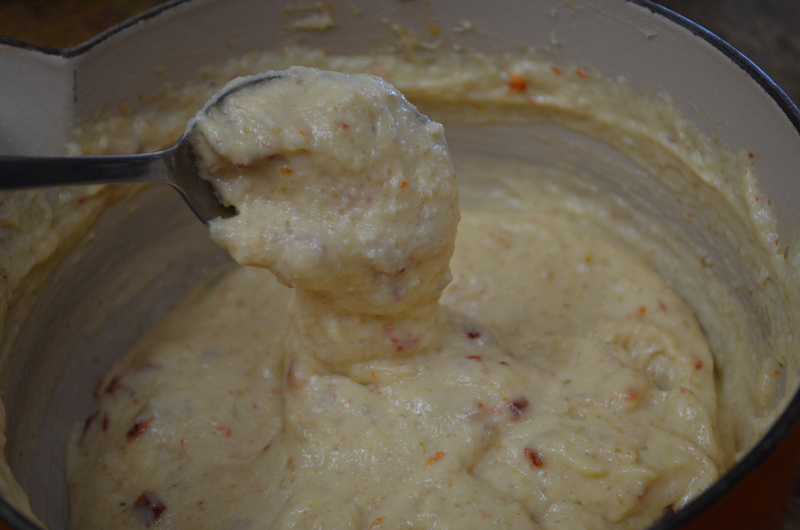 You can also cook this mixture in circles (to accept fillings and then be served as a main course – see below), or as little bowls (to accept fillings and then be served as hors d’oeuvres). This makes 36-40 mini gougeres. In a bowl, mix together the dry ingredients. In a medium saucepan, bring the vinegar, water and margarine quickly to a rolling boil. Remove from the heat, and quickly shoot all the flours into the boiling liquid, then mix furiously with a wooden spoon until a stiff dough is formed (I managed a whopping 30 seconds before my arm gave out), and allow it to cool for at least two or three minutes, so that it isn’t hot enough to scramble the egg that you’re about to add. This paste used all 4 eggs. I have subsequently used just 3 eggs to make a thicker mixture, which also worked nicely, but produced a construction with fewer holes. 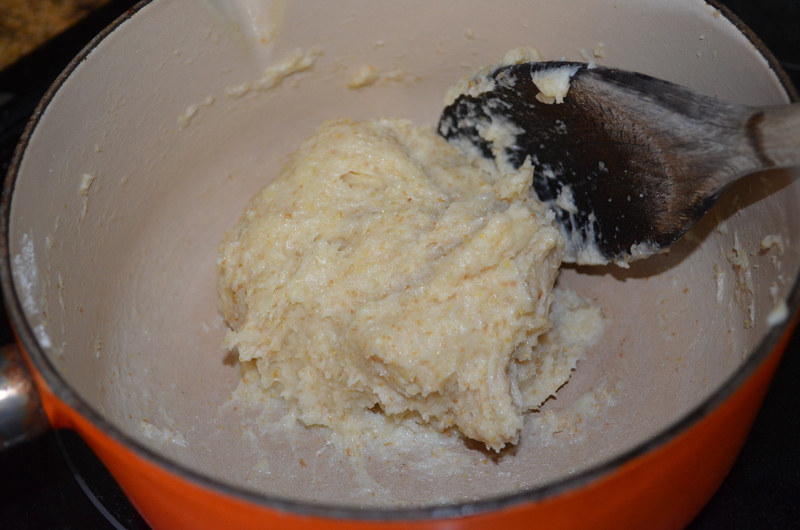 Now, using an electric hand mixer, thoroughly incorporate about a tablespoon of the beaten egg. Repeat this step until all of the egg has been absorbed, one tablespoon at a time. OR just place on a greased or parchment paper lined baking tray / cookie sheet in tablespoon sized dollops, or form 4″ wide circles, or pipe into 5″ long sticks. 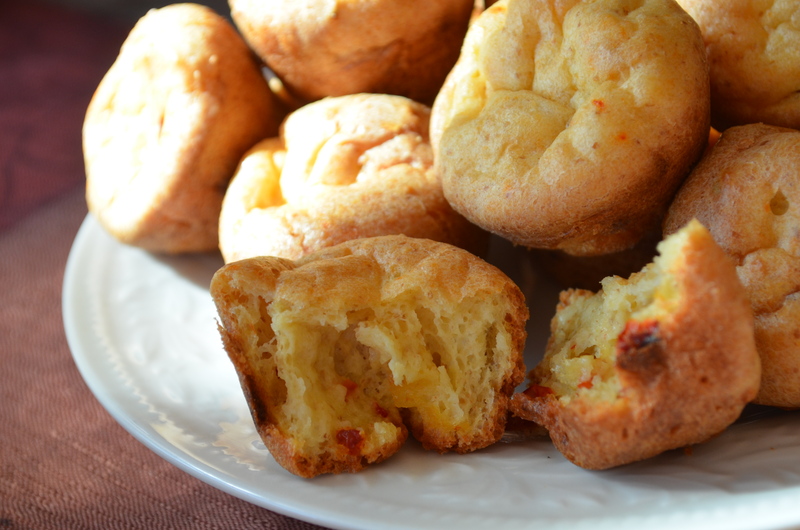 When you’re ready to cook the gougeres, preheat the oven to 400F. Place the tray in the center of the oven, and cook for 15 minutes. Turn the temperature down to 360F, and cook for a further 15 minutes. Remove from the oven, release from the tin with a knife, and serve as they are, or split, and fill with vegan cream cheese or somesuch. 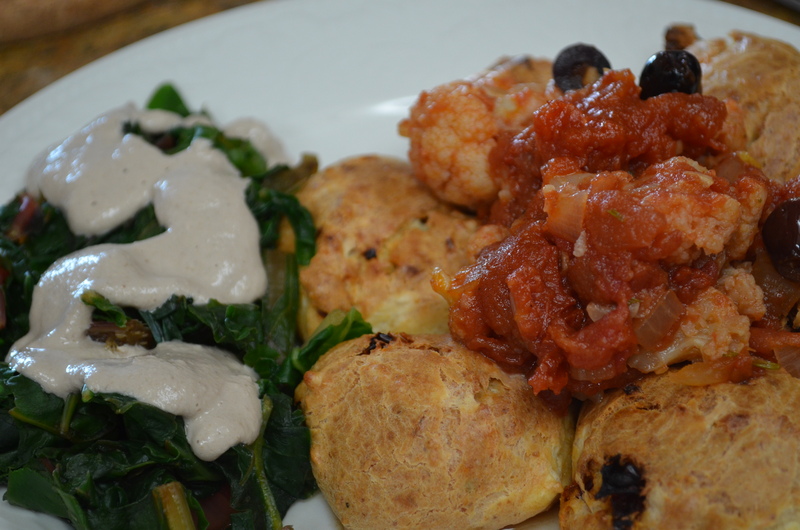 Sun dried tomato gougere stuffed with cauliflower in an orange/tomato sauce, served with steamed chard and a walnut sauce.